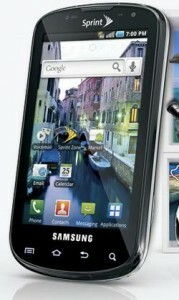 Yesterday Sprint announced that it will launch the Samsung Epic 4G phone on August 31st this year. The new phone, the Epic 4G is a variant of the Galaxy S smartphone but comes with 4G capability and comes with a slide-out QWERTY keyboard and even a nice front-facing VGA camera. The phone however has similar statistics as the Galaxy S smartphone. It is powered by a 1GHz hummingbird ARM processor and features a 4 inch touch screen, a 5MP rear facing camera with LED flash, Wi-Fi and Bluetooth. The phone will ship out loaded with Android 2.1 though there is word going around that there will be a Froyo update in the coming months. The phone also supports some of the coolest stuff such as visual voicemail, mobile hotspot capabilities, DLNA media streaming and TV Shows and movies that can be downloaded to the phone upon purchase. Sprint is already a leader in the 4G market with service in major markets. Sprint also is planning to launch the service by the end of this year and includes a number of cities including Boston, Cincinnati, Cleveland, Denver, Los Angeles, Miami, Minneapolis, New York, Pittsburgh, San Francisco, and Washington, DC. The phone is set to cost $249.99 with a two year contract and after a $100 mail-in rebate. Sprint will begin taking pre-orders from today, August 13th. You can pre-order one from here.